"I'd like you to know that I am very pleased with this product. I will be using it a lot." "Your product is so fascinating and transparent to the end user -- I can only keep on repeating, great product!" "Absolutely fantastic. Thank you very much for an extremely helpful product. The speed of this program is truly amazing." 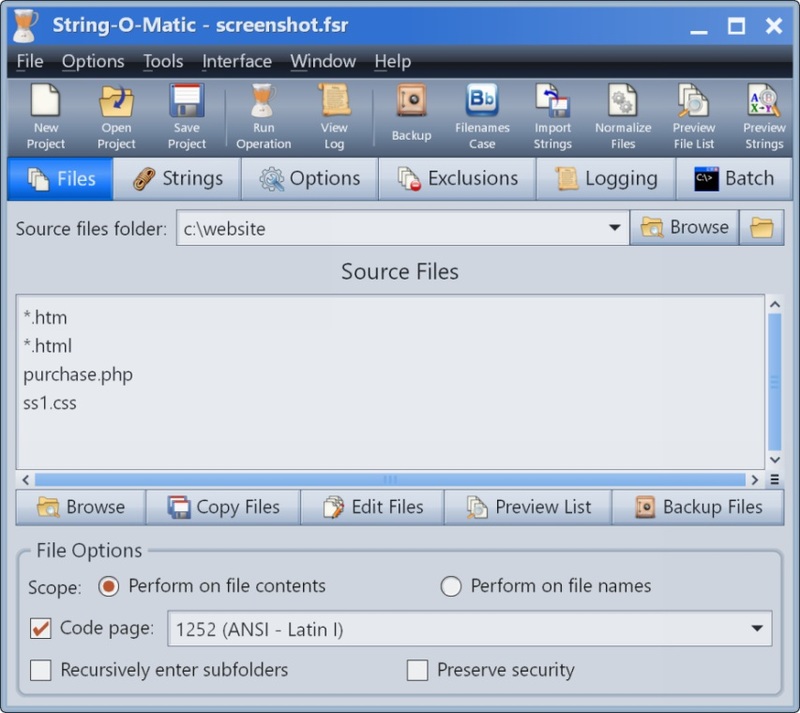 String-O-Matic performs search and replace operations with multiple strings in multiple files. It was designed specifically for computer programmers working on large projects with many source code files, however any type of file can be used, including HTML. String-O-Matic will save you so much time and tedium, it pays for itself on the first use. Works on 8-bit ASCII, 16-bit Unicode, and UTF-8 files. Not only can search and replace operations be performed on the contents of one or more files, but on their filenames as well. This is very useful for the automated mass renaming of files. Regular expressions are supported. Or, simple question mark and asterisk "wildcards" can be used. The search-only option allows you to preview the changes before they are made. Permits case-sensitive or case-insensitive searches. This includes all unicode letters, not just the latin letters in ASCII. The "Whole Word" option can be used to ignore matches that occur inside a word. For example, "amp" would be ignored if found in "example". Optional "Prompt on replace" mode supported. The source files can be backed up into a compressed Zip file. This can optionally be done automatically before a search and replace operation starts. Might just save your job. A MS-DOS command batch can be executed before and after the operation, and before and after a file is changed. This is useful for automating certain chores. The line numbers on which the operation is performed can be limited to a certain range. A detailed operation log is generated. Great care is taken when making changes to a file. The old file is renamed to a temporary file for safe keeping. The replacement is then written and verified. If no errors occur, the temporary backup file is deleted. Otherwise, the backup file is restored and the error is reported. These steps help ensure that data never gets lost, even in the event of a drive error. Includes a tool for normalizing newlines. This fixes files with bare carriage returns, bare line-feeds, and backwards newlines. It can also trim whitespace from the end of lines. Includes a tool for bulk filename case conversions. A thorough Help File describes all features in detail. A Tutorial and Wizard can assist with project configuration. Click the button below to download String-O-Matic version 28.0, released February 6th, 2019. Microsoft Windows is required (XP or later). The download is a self-contained executable installer. Simply open the file to begin installation. The download is approximately 11 MB and installation will use approximately 41 MB of hard disk space. In trial mode, search and replace operations are disabled. Only searches are permitted. To unlock this limitation, please purchase a license. Many data file formats, including MS Word, Access, and Excel, are sensitive to changes in the length of substrings. Unless the search string is the same length as the replacement string, the file will be corrupted. Plain text files, such as source code and HTML, are not sensitive to such changes. Always backup your files before using String-O-Matic! To purchase a license for only $20 U.S. please click the button below.